At first sight, the relationship that architecture has with comics seems to be obvious and inarguable. According to Frank Lloyd Wright ‘architecture is life; or at least it is life itself taking form and therefore it is the truest record of life as it was lived in the world yesterday, as it is lived today or ever will be lived’ (Baker 2008, 117). As comics is a medium that usually portrays human life through its characters, the representation of architecture will help the reader/viewer to understand the characteristics of the characters, since architecture is an interface created by Man to make the world fit to his needs and routines. However, the relationship that architecture has with comics is not limited to obvious representations of it in comics; it is also present in depictions of its creative process and even in the similarity between the experiences of the comics reader and the user of architecture. According to Buchet (2013), the architect can be compared to a strip cartoonist: when he draws a museum or even an airport terminal, there is an implicit narrative that the visitor reads when attending these places. In this article I will enumerate four instances where architecture is present in comics and explain the different scopes and effects of its presence. 1. Comics where architecture is the main subject and the main reason for their creation. In this case, comics is the chosen medium to communicate ideas of architectural projects and theory of architecture to a wide-ranging audience, composed of specialists and non-specialists. The choice of the comics language to communicate architectural ideas is related to its combination of images and words, which is common to architectural drawings. According to Syma and Weiner (2013): ‘visual narratives like comics and graphic novels show that they hold possibilities for communication that are unique, exactly because they combine the regimens of art and literature’ (187). The image in comics summarizes a description that would be extensive if it was written in other media and according to Scalera (2011, 74), ‘words are placed strategically and artistically to complement and guide the flow of the artwork’. But what makes comics special relative to the technical drawings of architecture are the sequentiality that allows the reader/viewer to see the contiguous panels almost simultaneously with the vignette that is being read and the possibility for the reader/viewer to control the speed of the reading (and the knowledge apprehension). If architectural drawings are organized by scale, from the largest to the smallest, the vignettes in comics are organized by time. As such, comics could be a great media to understand the partial chronologies that are implemented in any plan (Bartual 2013) because it allows the creator to show the interaction that inhabitants have with the drawn architecture by time sequence. In architectural plans and sections, the functions of the drawn spaces seem to be abstract areas at the first glance. Figure 1: Pages 68 from the book Yes is More. A sequence of axonometries in the top of the page shows the different stages of the building volume-shapes until reaching its final shape. Credits: Bjarke Ingels Group (BIG). Used with permission from BIG. During the book, architecture is shown by schemes, technical drawings, models, photos and renders supported by text that links these images. The book consists essentially of an illustrated monologue addressed to the readers, in which the architect is the narrator and sometimes a character. The texts from Yes is More do not depend on the images to be understood, unlike its images which depend on the text to make sense and add new architectural information to them. The biggest part of the narrative happens in flash-back; project decisions that were taken during the architectural conception are explained by the architect in diegetic time, however, the images that are exhibited in the book were produced during the project´s development process, that is, in the past. As such, the text of the book obeys a time sequence that is typical for comics; however images are shown just to illustrate the projects that are described in the text. For this reason, the idea developed by McCloud (1994, 100) that time and space in comics are one and the same is not applicable to this case. As happens with photography, the abundant use of realistic renders produced in computer software to show the created spaces in perspective, beyond abolishing the authors’ emotions, experiences and the characterization that the space could have if it was inhabited also abolishes the time duration that McCloud (1994, 102) refers to in Understanding Comics, conferring the idea of eternity upon the depicted architecture. According to Hatfield (2005, 52), synchronism, in which a single panel represents a sequence of events occurring at different “times”, offers images that can make sense only within a static medium. This sequence of events to which Hatfield refers is absent in these architectural renders because there is a lack of motion lines and other ideographic shorthand to denote movement. Figure 2: Page 20 from the book Yes is More. This page shows the environment lived in the architectural design studio. Credits: Bjarke Ingels Group (BIG). Used with permission from BIG. However, these images belong to a logic defined by the architect to help the reader to build in their mind a model of the project through which he can understand the volume, the colors and the main concept of the project. Actually, this strategy used by Ingels is similar to a usual conversation between the architect and his client. In this specific case we can conclude that comics as a medium was adapted to serve the architect´s goals and this justifies why the author uses the term “Archicomic” to differentiate his book from conventional comics. After reading this book, we feel that the potentialities that comics has to communicate were not fully explored. More than explaining the project´s development process, comics could be used to forecast the interaction that the inhabitants will have in the created architectures by presenting narratives where the inhabitants are the main characters. However the methodology used here, collecting images that were created during the project´s development and articulating them with the text, does not allow Ingels to do that. 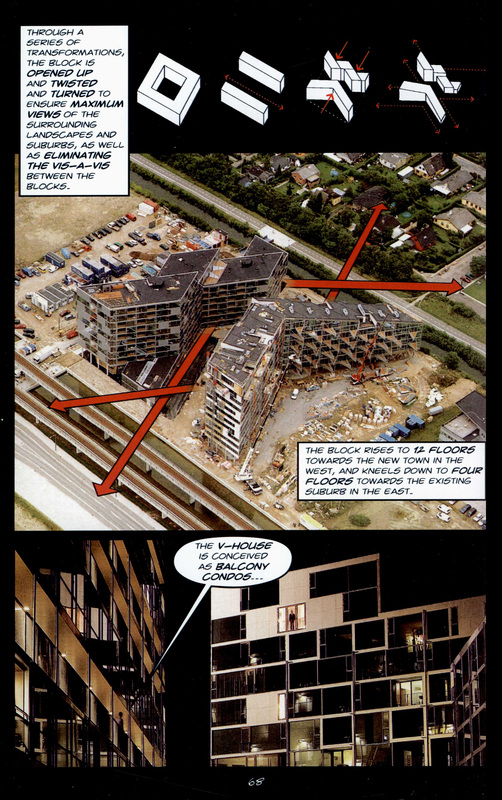 In a comic book that has as the main scope explaining architectural projects we could expect that the drawn scenario representing the created spaces would be the main element responsible to simulate sequentiality, similarly to the narrative time in films (Harvey 1996, 176), but this does not happen here. However the book also explains efficiently the project choices by sequences of axonometries  that show the transformations of the volumes during the project, the environment lived in the studio during the project and even the constraints of all architectural stages. Such benefits can be considered a great argument for the creation of new archicomics. Figure 3: Pages 26 and 27 from the book Yes is More. Credits: Bjarke Ingels Group (BIG). Used with permission from BIG. 2. Comics whose authors use the project based methodology of architecture to create fictional scenarios that fit to the actions and characteristics of the characters. Some comics’ authors that create science fiction series have a creative attitude that is similar to that of architects: they select and discard the existing things to create something new. Consequently, the created architecture that belongs to these scenarios is the sum of elements from architectures that already exist in reality. The project methodology includes scientific research, building models of the created cities and drawing subtitled plans and sections of the buildings that contribute to the coherence and sequentiality of the represented diegetic scenario and to the naturalness of the interaction of the characters in the scenario. As the authors have the freedom to create a new architecture, they often use it as a metaphor to characterize a society, a regime, etc. (Lefévre, 157). Sometimes these comics also work as myths that are created to stimulate interventions in the contexts where they were created. According to Georges Sorel, “we act politically according to myths of the future which may never materialize literally, but which motivate us nonetheless into productive action”. (Birenbaum 1988, 188) In the series Le Cycle de Cyann by Bourgeon and Lacroix, a new universe was created. Fortunately, the created places are not comparable with the real ones; however it is a representation of how our world could be in the future if we do not try to change it. For example Marcade, from the book Les Couleurs de Marcade, is a capitalist city where even the right to privacy is paid for and consequently all human actions are supervised. The people pretend to conform to this situation; however they do not feel comfortable with the public exposure of their intimate lives. In terms of its architecture, the city is built on a limited platform above the soil that is supported by pillars. Below the platform, a set of clouds covers the soil, on which people do not know what happens. This architectural attitude is reminiscent of the city upon columns, created by Eugéne Hénard (a visionary urbanist) and one of the five points for a modernist architecture, enumerated by Le Corbusier. For Le Corbusier, beyond the use of pilotis  to liberate the soil from construction and allow the free circulation of people and vehicles, modernist architecture should have free design of the ground plan, horizontal windows, free design of the façade and roof garden. If pilotis were used by Corbusier to allow the freedom of movements, in Marcade they are used to trap people in a limited area. The use of pillars in buildings confirms that the created planets in the series have an identical gravitational force to Earth. The science fiction essence of the series is mainly given by the clothes and bizarre hairstyle fashion, the animals’ bodies (but not their vital systems), the different names given to things, the vehicles and the shape of the buildings. According to Bourgeon, the scenario should be narrative and this example proves it very well , because it helps us to understand the regimen of Marcade and its inhabitants´ behaviors. For the reader/viewer that certainly has experienced better places to live, he can easily speculate that the soil represents a utopian place in which all the Marcade inhabitants would wish to live if they knew of its existence and the clouds an element that serves to instill fear in people and that they wish to avoid. From this point of view, the architecture in this study case does not serve to protect its inhabitants as it should do in reality and as its inhabitants think: architecture is no more than another instrument created by someone who wants to isolate people from the rest of the world to control them and impose a dictatorship. This importance given to the scenario is possibly influenced by Bourgeon’s previous creation of historic novels like Les passagers du Vent, where the accuracy and realism of the scenario make the reader understand that the narrative is about the transatlantic slave trade in the eighteenth century. His previous experience in creating historic novels made him understand that a logical and accurate representation of the scenario is indispensible to make the narrative credible, independently of the series´ genre. If in historical novels a previous work of research is required to have sufficient elements to represent the scenario coherently, in science-fiction the elements used to support the representations of the scenarios need to be created. Bourgeon and Lacroix chose to materialize the created cities by constructing models to facilitate the visualization of the created scenarios. Despite the attention given to making the characters’ actions and proportions correspond to the created scenarios and the fact that the newly created objects have similar characteristics to the real ones, they are detached from reality by the new designations attributed to things.This detachment obliged the authors to create a special book which is a compilation of all research work and a glossary that is intended for use by the readers to facilitate their reading process by explaining the fictional elements and comparing them with the real ones. The places which were represented in this study case are mostly dystopian. Dystopias can only be understood as such if the reader-viewer has ideas of utopias. In response to the dystopias presented in comics, the reader/viewer generates a mental construction of an ideal place, to escape from these represented spaces. 3. Architecture in comics as a representation of the reality, framing the narrative in a certain real spatio-temporal context. In some series, the representation of real architecture in comics can assume a pedagogical function, allowing the reader/viewer to acquire knowledge from architectural history, even if he does not have intentions to learn. Great examples of such titles can be found in the Les aventures d´Alix  and Vasco  series, where architectural representations are accurate and texts are sometimes extensive and very informative about the historical facts. However, sometimes the pedagogical role is simply to prompt the reader/viewer to research more widely about architecture, even if the architecture represented in the scenarios has some inaccuracies and indicates a lack of knowledge. Asterix, in the genre of humor, is a great example of this. In the first example, authors like Jacques Martin and Gilles Chaillet must undertake exhaustive research that includes travelling to the represented places and the study of some specialized bibliography. When the represented places are currently in ruins, they are reconstructed in their representations as if they were inhabited, and sometimes the images that the comics’ authors create of these buildings in ruins are the only existing representations of those places. According to Desrochers (2006, 189) westerners’ perceptions of ruins have changed since the Second World War, and the worsening of environmental problems became a subject of appropriation instead of an enchanted memory from a distant culture. But what is the enchanted memory to which Desrochers refers? Westerners have not lived in the period when the buildings were built: the memories are limited to those which historians have imagined and have articulated based on the traces of which they have no memory. The authors of comics in the historical genre, as well as historians, interact in the process of constructing memories, by the chaining together of the images and the narrative. Apart from the representation of the unknown, according to Lefévre (2009, 157) some authors ‘use stereotypical icons (like the Statue of Liberty for New York or the pyramids for Egypt) because such famous buildings or monuments can be easily recognized by the readers.’ By recognizing these stereotypical elements, the reader/viewer also assumes that the narrative happens in the city where these icons belong in the reality, even if there are other elements that were created by the author. The representation of old buildings in comics can also affirm desire on the part of the author to generate respect for these buildings and is not necessarily used to build new patrimony or to give an opinion about ancient architecture and urbanism. As we can see, the representation of architecture from the past could have a pedagogical role, but it also could communicate the author´s desire for an intervention in the views of the audience. 4. Authors that avoid the representation of architecture in comics. However when the absence of architecture occurs in a scenario that aims to exist as an empty place, without an adaptation to Man, and the main characters are humans, the role of architecture should be more important than it seems at first glance. Man has a symbiotic relationship with architecture: Man needs architecture to protect him; however architecture needs Man to be built and to acquire history. When architecture is absent, that means that there is no history of Man in the place and a human visitor should feel lost in this place. In the Le monde d´ edena series by Moebius, these kinds of scenarios are very frequent. In the second book of the series, Les Jardins d´ edena, the main characters are sent to a garden that is similar to the Christian Garden of Eden, something that is alluded to by the book’s name. This garden has sufficient resources to guarantee the inhabitants´ subsistence, however as the characters always lived in a world where all is transformed to fit to them, even the food, the characters feel uncomfortable in this place. This episode makes us think about the role of architecture in our lives and how we are currently dependent on it. As the series also occurs in a series of dream stages, the occasional absence of architecture could be related to the contrast between the immateriality and abstraction of the dreams with the rigidity and materiality of the architecture. As such, we can think about the representation of architecture in comics as a way to make a narrative more plausible and grounded in reality. Having analyzed four instances where architecture is present in comics, we may conclude that architecture is present in comics as it is present in reality. When it does not appear, the reader finds its absence strange because the actions of the real people and the characters are adapted to the space they are attending, just as space is created and adapted to the actions of Man. This justifies the choice of using the same methodology that is used in architectural projects to create scenarios for science fiction comic books. As comics are usually composed of panels that frame characters actions and architecture frames human actions, the choice of comics as a medium to explain architectural projects has some potentialities that seem not to have been fully explored yet. However, examples like Yes is More have some strong points that may indicate directions for further exploration in future attempts. Baker, W., 2008. Architectural Excellence in a Diverse World Culture. Victoria: Images Publishing. Birenbaum, H., 1988. Myth and Mind. University Press of America. Bourgeon, F. and Lacroix, C., 1997. La Clédes Confins.Bruxelas : Casterman. Bourgeon, F. and Lacroix, C., 2007. Lescouleurs de Marcade.Porto: Asa. Choay, F., 2002. O urbanismo: utopias e realidades: uma antologia. São Paulo : Editora perspectiva. Harvey, R., 1996. The Art of the Comic Book: An Aesthetic History. Mississippi: University Press of Mississippi. Hatfield, C., 2005. Alternative Comics: An Emerging Literature. Mississippi: University Press of Mississippi. Hockings, P., 2009. Principles of Visual Anthropology. Berlin: Walter de Gruyter. 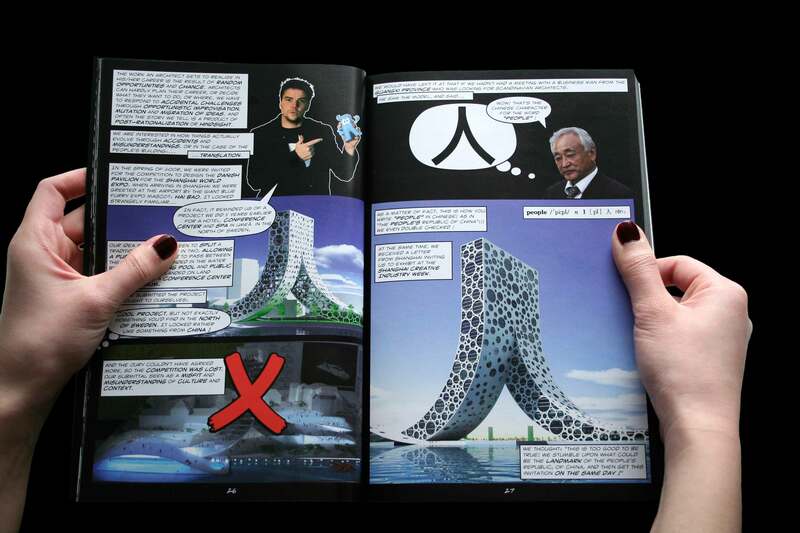 Ingels, B., 2009.Yes is more : An archicomic on architectural evolution. Köln : Taschen. Lefévre, P., 2009. The Construction of Space in Comics. In: Heer, J. and Worcester, K. A Comics Studies Reader. Mississipi: University Press of Mississippi,157-162. Mackay, J. and Sirrup, D., 2013.Tribal Fantasies: Native Americans in the European Imaginary, 1900-2010. New York: Palgrave Macmillan. Madge, J. and Peckham, A., 2006. Narrating Architecture: A Retrospective Anthology. New York: Routledge. McCloud, S., 1994.Understanding Comics : The invisible art. New York: HarperCollins Publishers. Moebius, 1992.O mundo de Edena: os jardins de Edena. Lisboa : Meribérica-Liber. Scalera, B., 2011. Creating Comics from Start to Finish: Top Pros Reveal the Complete Creative Process. Ohio: Impact. Syma,C and Weiner, R., 2013. Graphic Novels and Comics in the Classroom: Essays on the Educational Power of Sequential Art. Jefferson: McFarland. Information obtained through e-mail interview. Similarly to perspective, axonometries are projections that simulate three dimensionality through a bi-dimensional drawing. Axonometries differ from perspective in its method of construction: if perspectives are constructed through one or more vanishing points that belongs to the same horizon line; the visual construction rays in axonometries are parallel, vanishing to no point or to a point located infinitely far away. Constraints are considered to be all the factors that obligate the architect to make certain options during the project. The program, the legislation, the place on which the building will be built (its dimensions, inclination, orientation, etc,..), the available budget, the costumes, etc. are a few examples of these constraints. Pilotis are supports of reinforced concrete such as columns and pillars that are used in the ground level, allowing the use of this level for circulation, gardens and other uses. Les Aventures d´Alix is a French series created by Jacques Martin (1921-2010). According to Miller (2007, 19), this author used the clear line style from the École de Bruxelles, similarly to well-known authors like Hergé and E.P.Jacobs. Vasco is a French series created by Gilles Chaillet (1946-2011), one of the disciples of Jacques Martin. He also drew two albums from the series Les Voyages d´Alix that was created by Martin. Congratulations Renatta. Incredible your article of architecture and comics. 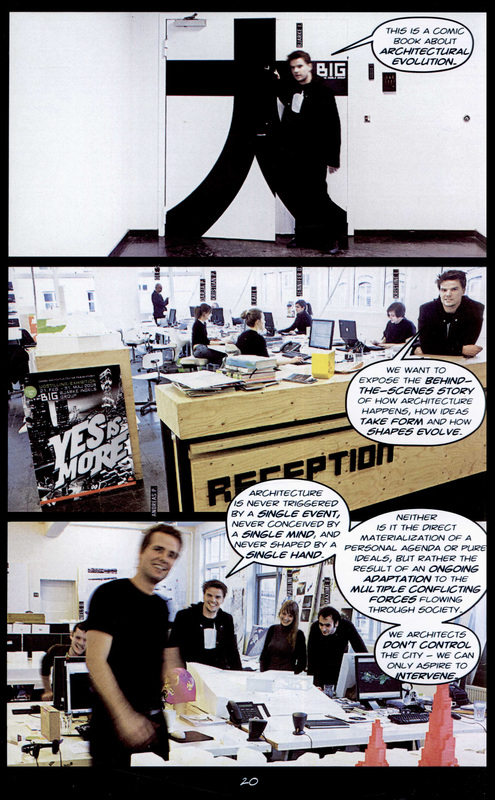 It´ s true architecture as an art and science is involved in comics and many manifestations of art. I think architecture is a great background to capture a scene and explains the whole idea of what the artist want to say. Architecture is not also being part of the great world of comics but also in movies and videogames. As an architect and a die-hard fan of videogames, I like the experience to play with stunning graphics and visuals but a great architecture is essential, real or fictional, built by architects. I like comics since I was a child, I admire the great work of QUINO, an artist from Argentina who create the comic of MAFALDA, truly a masterpiece. I remember, as part of an assignment in the university, that a teacher leave their students to make an architectural model of their vision of Mafalda´ s home, very metaphoric and innovative. Greetings and all the best to Renatta for mix comics an architecture, a great blend to taste !!!. Fernando Rivera, from Lima-Perú.